For one day a year, it’s okay to cement your teeth together with sticky, chewy, and stretchy taffy. You can even blame us for telling you that the next time your dentist gives you the stink eye! This National Taffy Day, learn how to make your own taffy at home. There are so many different kinds out there, but we’re going to show you how to make one of the most famous taffies of all: salt water taffy! We hope you enjoy trying something new and the yummy product you end up with. We’re using a tried and true recipe we’ve made time and time again: strawberries and cream salt water taffy. If you want to make another flavor, simply swap out the food coloring and extracts for flavors and colors that suit your fancy. For instance, you could try green coloring and peppermint extract for mint salt water taffy, or chocolate extract and brown food coloring for chocolate taffy. The choice is yours! Here’s what you’ll need to make three pounds of this strawberries and cream salt water taffy. Trust us, you’ll love it. Once you start making taffy, you might get a bit sticky. That’s why it’s important to prepare your workspace before you get cooking. Make sure you have a large, clean countertop and all your ingredients laid out. That’ll make it easier for you to grab what you need without leaving a sticky trail behind on cabinet pulls and door knobs. We also suggest donning an apron to keep your clothes clean and yourself looking stylish while you confect. First, you’ll need to combine sugar, corn syrup, salt and water in a 4-quart pan (or larger). Before you start cooking, get out two 7 x 11 jelly roll pans (ones with an inch-high lip) or cake pans. Butter the insides so when you pour the cooked taffy into the pans the mixture won’t stick. Turn your burner on medium high, making sure to whisk constantly until your sugar has dissolved and the mixture is thick and syrupy. Once combined, stop mixing! This is important so the sugar can crystalize. Put a candy thermometer into your pot and monitor it carefully. Once the temperature reaches 260 degrees (Fahrenheit), immediately take the pot off the heat and mix in your butter, extracts, and food coloring. So you don’t become one with the taffy, grease up your hands. We suggest using butter, but Crisco will do too. Take your taffy out of the jelly roll pans and roll it into a ball in your hands. Then, get ready for a workout. You’ll need to pull the taffy apart (like you’re playing an accordion) until it’s a much lighter color and difficult to pull. If you need some visual guidance, jump to 3 minutes 30 seconds of this taffy tutorial to watch an expert hand pull taffy. thick rope. After you have thin ropes of your taffy, it’s time to cut them into bite sized pieces! We suggest making each taffy piece about 1-inch long. That’s the perfect size to pop in your mouth. 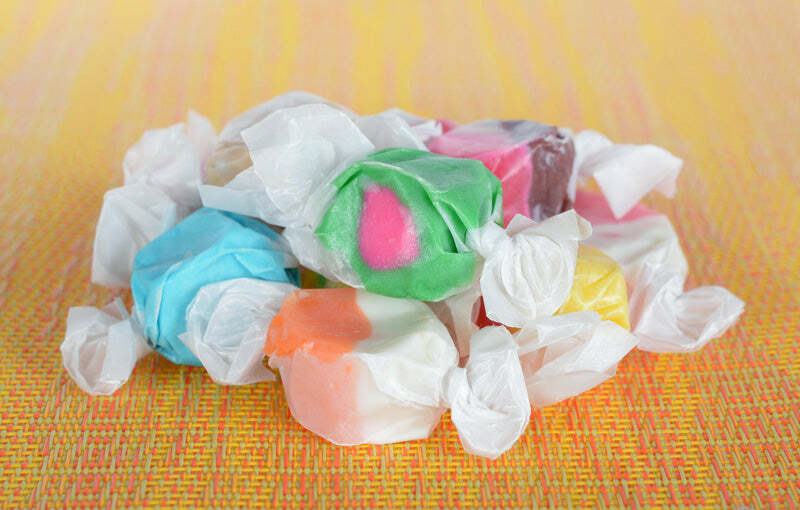 Finish your salt water taffy by giving it the distinct wax paper wrapping. Then, you can give it away as gifts or put it in candy dishes. 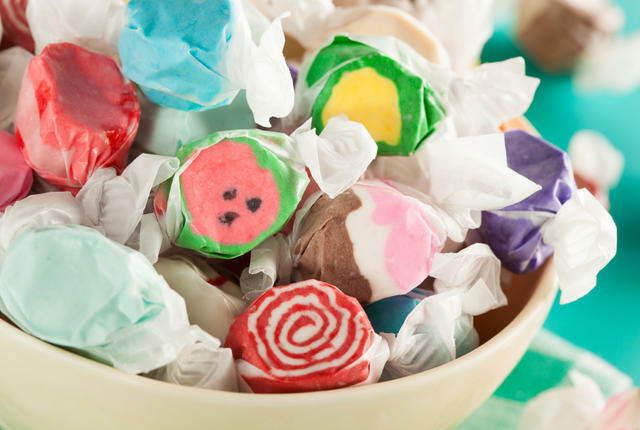 Homemade salt water taffy is best when eaten within 7 days, but you can freeze your taffy for up to 6 months or keep it in the fridge to keep it fresh for two weeks. If frozen, just let the taffy come to room temperature for a couple hours and enjoy. If you want to celebrate National Taffy Day without getting sticky, you can also shop our large selection of bulk salt water taffy. But we encourage you to roll up your sleeves and try something fun, delicious, and new. Who knows, taffy-making might become your new favorite hobby! Share your experience and final products with us in the comments section. We’d love to see how you do.